Easy Crock Pot Tomato Sauce. Tomato Sauce is a lot like ketchup and BBQ Sauce, in the fact that you can’t seem to find a store bought kind that doesn’t contain processed sugar. 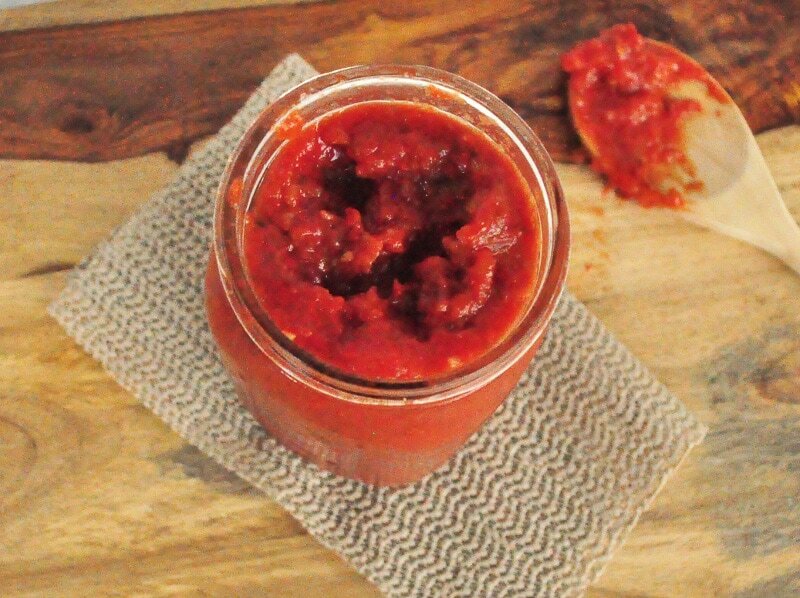 So, I set out to create a super easy, crock pot tomato sauce that tastes great with no added sugar. When we got our co-op basket this past week, I saw a package of tomatoes on the vine and I knew I was going to use them for sauce. This crock pot tomato sauce recipe is almost as easy as my Homemade Vegetable Stock. This sauce is so easy that you really just throw everything in the crock pot and walk away. Plus, it makes a ton. We freeze it for those busy days when you need to make dinner in a hurry. You can pull it out in the morning and let it defrost on your counter top all day. Throw everything in the crock pot and cook on high for at least 3 hours. I like to cook it longer because the longer it cooks, the more developed the flavor gets. If the sauce seems thin to you, you can thicken it with a tablespoon of arrowroot. You can also uncover and let it reduce while cooking. This sauce would also make a great sauce for my Rustic Vegan Pizza . If you like a super smooth sauce, feel free to blend it with an immersion blender. I just finished making my third batch of this recipe (which I have doubled and tripled). I use the tomatoes that I grow and the ones from our CSA. I don't cook it in the slow cooker because it's too water - I cook it on the stove top and let it reduce down. I will be canning it today. My husband loves it and was dying last night to have some (we didn't - I had other dinner plans). Thank you for this awesome recipe! You are so welcome Karen! Good to know this recipe can be canned. I have never tried canning it. Only freezing. I was going to use tomatoes from the garden and leave the skins on and put through the Vitamix when cooked to make a smooth sauce. Do you think this would work? How do you know what a can of diced tomatoes equals to 12 tomatoes? Are you using fresh or dried herbs? I used dried for the oregano and thyme. The basil was fresh. I just had an overflow of tomatoes so I put everything in the crockpot with a little beef broth and everything else I hope to wake up to something good.. This sounds like a great and easy way to make sauce from all my CSA Share Tomatoes! Thanks! Do you deseed the tomotoes as well? Or just peel and chop them? Also, do you need to leave the lid off to evaporate some of the juices or do you find just time does that? I do peel them, but I don't remove the seeds. If seeds bother you, you can remove them too. If the sauce seems too thin, you can cook it with the lid off to thicken it up. I didn't remove the seeds from the tomatoes. Is that why mine turned out to be a little bitter? I am not a cook just learning now and I'm not sure what I did wrong. 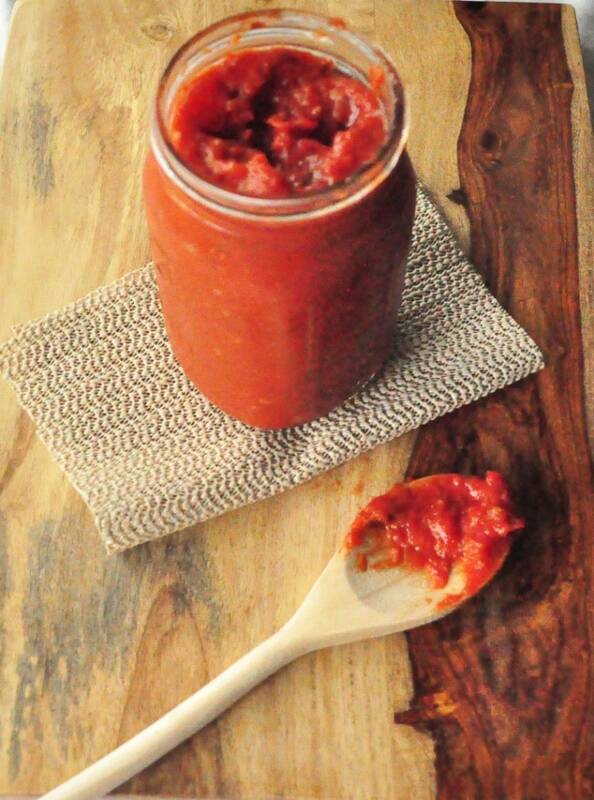 Pingback: Homemade Tomato Sauce – Food. Fitness. Funn. I just found your recipe and am trying it. I ended up with approx. two large crock pots full of sauce to start. I used my tomato strainer. Took awhile to figure out how to get it to crank without pouring tomato juice all over the kitchen. But all I did was cut the ugly part from the top of tomato and cut them in about six pieces and throw them in the strainer and start turning the crank. I have it cooking but have not added the spices. Had to clean up the mess before husband had a stroke with tomato sauce her there and ever where. How long do you can it ??? I've never tried canning it. How much tomato would that be by weight? There are a couple sizes of tomatoes on the vine at my store. I'm not sure since tomato weight can vary slightly.